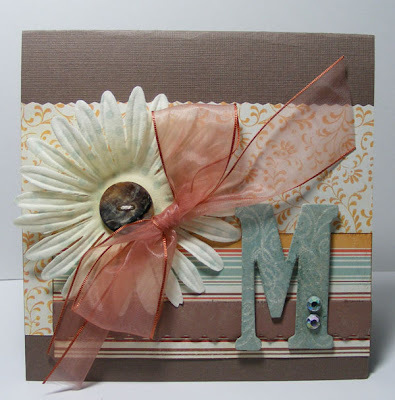 Lisa E Design Blog: Happy Mother's Day! Happy Mother's Day to all Mothers, Grandmothers, Step-Mom's and all ladies who care for children, young and old. I made this card months ago for my Mother based on a card in a magazine. "M" is her first initial. The chipboard is Stampin' Up! and inked in Close to Cocoa. The paper is My Mind's Eye. I'm not sure the source for the ribbon or the M. I think I inked the M in Baja Breeze and stamped whisper white on then embossed. It's been awhile and I've forgotten the specifics. The only thing important is that she loved her card and I love her much more.